Wednesday 1st March not only marked Bosleys first public auction of 2017, but also marked the special landmark of being Bosleys 100th public auction of specialist Guaranteed Original Military Antiques. Bosleys remains the longest established UK Auction house solely specialising in the sale of original guaranteed Military Collectables and it was this guarantee which fuelled probably the most active bidding session when an outstanding collection of German Third Reich Allgemeine-SS items were sold. 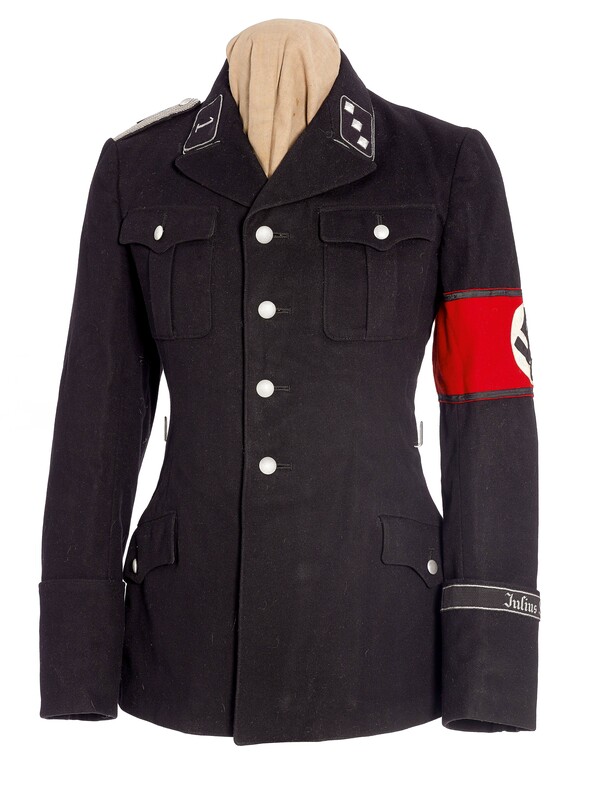 Late in the day, the room was full and virtually every lot was contested for by a number of internet bids and room bidders, an outstanding example of an Allgemeine-SS Officer’s black tunic worn by an SS-Untersturmführer tunic sold for £6,000, an SS-Untersturmführer Greatcoat £1,800, Officer cap £4,000 and a NCO’s cap £2,600. Of the 86 lots only one remained unsold. A surprise of this section was a superb WW2 period miniature Kriegsmarine dagger, being sold on behalf of a charity shop, this gift just kept climbing as three collectors fought to own it, finally selling for £1,200. Described by a local vendor as “a German bayonet brought back in the war by my dad” turned out to be a sleepy SS dagger, an example you do not have to look at twice, this was certainly the case with a final hammer price of £1,500. 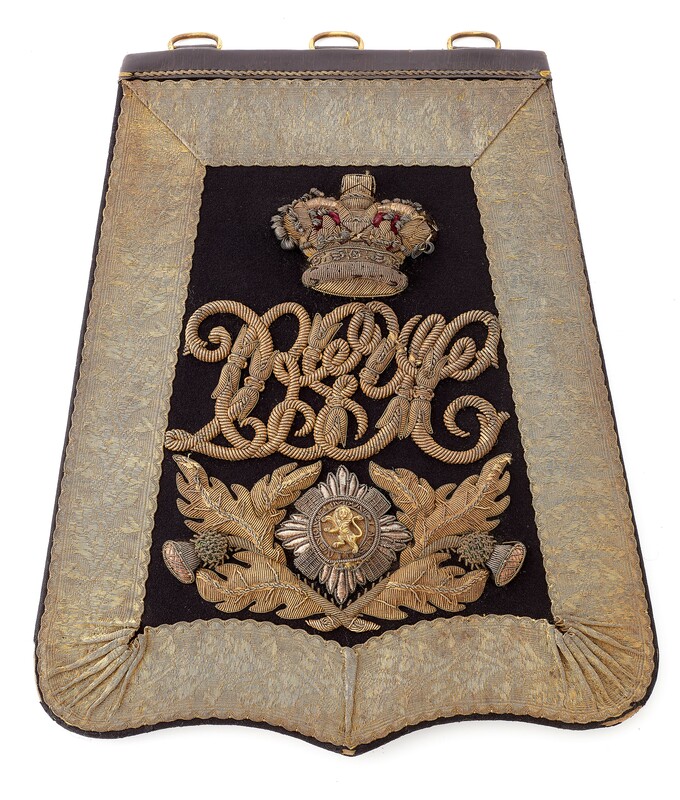 A 399 lot badge section contained a number of outstanding items charting the regiments of the Empire from George III through to Elizabeth II and some high hammer prices were achieved including 39th (Dorsetshire) Regiment of Foot, Victorian Officer’s shoulder belt plate circa 1825-55 at £2,200, Indian Army. 31st Trichinopoly Light Infantry Victorian shoulder belt plate £1,900, 62nd (Wiltshire) Regiment Foot Officer’s Belltop shako plate circa 1829-44 £1,300 and do not forget the humble uniform button with 24 buttons of the 1st Foot - Royal Regiment - Royal Scots. selling for £1,400. A strong section of accoutrements saw a Queen’s Own Glasgow Yeomanry Cavalry Victorian Officer’s Sabretache, a superb example selling for £2,000 and a surprise to the room was a fine pair of polished brown leather mounted Officer’s pistol holsters by Whippy & Co of London which sold for £950. A WW2 Bomber Command double Gallantry medal group, of Distinguished Flying Cross and Distinguished Flying Medal sold for £5,100 the recipient having flown on 72 operations over enemy territory. This was complimented by a rare Royal Naval Reserve Distinguished Service Cross group awarded to Surgeon Lieutenant Alexander Gibson Reid for gallantry during the sinking of HMS Mashona during the search for the Bismarck May 1941, selling for £1,600. The humble Bugle Boy usually the youngest member of any regiment was represented in two wars, with a rare brass Imperial Russian bugle picked up in the Crimean War selling for £1,100 and a bugle represented the last major British war of the 19th Century with a standard copper and brass regulation bugle carried on the march to Pretoria by Bugler F. Burrows of B Company 2nd VB Lincolnshire Regiment during the Boer War, saw a humble start of £100 up to a final hammer of price of £1,100. Bosleys are known for always offering a fine selection of military head-dress and this sale contained probably one of the best selections. A Lanarkshire Yeomanry Cavalry attributed Shako Circa 1850 was complimented by coatee, box pattern epaulettes and waist sash, selling for £5,600. 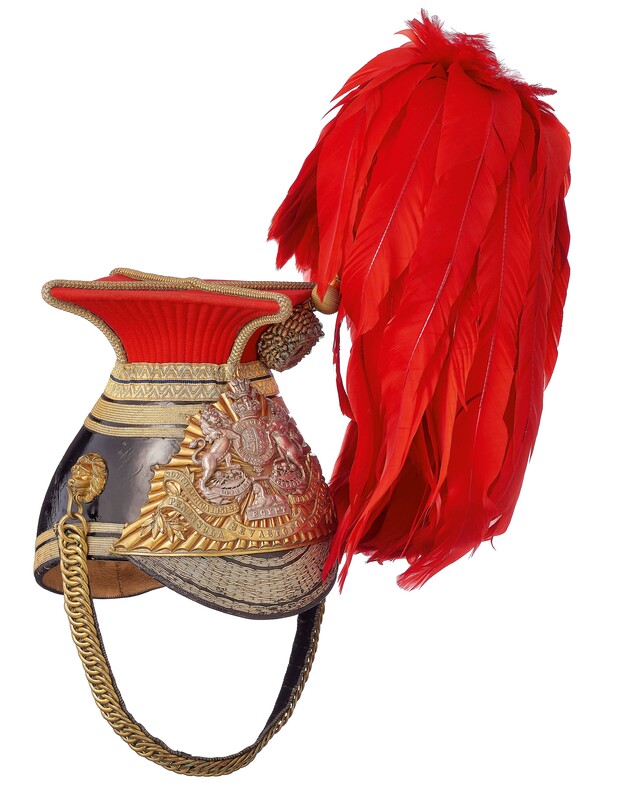 A superb Officer’s Lance cap of the 12th Royal Lancers, contained in original named metal storage tin sold for £6,500 and a similar important regimental example to the City of London (Rough Riders) Yeomanry worn at the coronation of King George V sold for £4,000. A very rare item tucked away in this section was a Boer War Officer’s helmet which sold for £1,200 and returning to the Parade ground was an Hertfordshire Yeomanry Victorian Officer’s helmet which sold for £1,800. A quick look at the uniform section saw a rare Crimean War Officer’s coatee to the 25th Imperial Russian Regiment selling for £6,000 and the Special Air Service 21 SAS “Founding Father’s” Uniform worn by Lieutenant Colonel Ronald Hugh Grierson, who had participated in SAS operations in WW2 and was the first Commanding Officer of 21 SAS holding the post from 1948 to 1952. sold for £1,300. The aviation section contained a number of WW2 period flying helmets and also a rare WW2 Luftwaffe Bombing map of south London, showing important targets, this item had attracted International and National press coverage and sold for £650. 2017 also saw Bosleys introduce what is hoped to be the first of many, a Spring sale of Arms & Armour, and after a number of request from clients and vendors it was decided to split this sale into two sections, to be sold between Bosleys and our sister company, Marlows of Stafford, this appears to have been the right decision with the 1st Section, Swords and weapons been sold here in Bosleys, the first lot of the section was a Victorian 1st Buckingham Rifles Volunteers Officer’s Sword,estimated at £180 to £220 it raced to a hammer price of £700. This seemed to set a precedent as many for the swords were duelled for with vigour. A second special pattern presentation sword to the 1st Bucks Rifle Volunteers sold £1,600 and the historically important Royal Navy Flag Officer’s Sword attributed to King George V sold for £6,000. An Edward VII 2nd Life Guards Officer’s State pattern sword sold for £1,500 and a Royal Navy sword attributed to a WW2 U-Boat killer Captain sold for £420. The end of this section included a rare 1882 dated lance carried by a Trooper of the 5th Lancers which sold for £500. The second part of the Spring Arms & Armour sale will be held at Marlows of Stafford on the 4th May and will include the Antique Gun section and also a number of edged weapons etc. A number of rare 19th Century examples have been consigned and information can be found by clicking the Stafford Auctions link button. We would like to thank all who participated in our March auction which saw 875 lots go under the hammer, consignments are already arriving for what promises to be an equalling exciting July auction. Details of consignments will be posted soon.